Passing through the aisles in the grocery store, it is easy to walk by the prepackaged, cellophane wrapped bunches of flowers. However, it’s time to STOP! With a little creativity you can take these common flowers and use them to make something truly special! 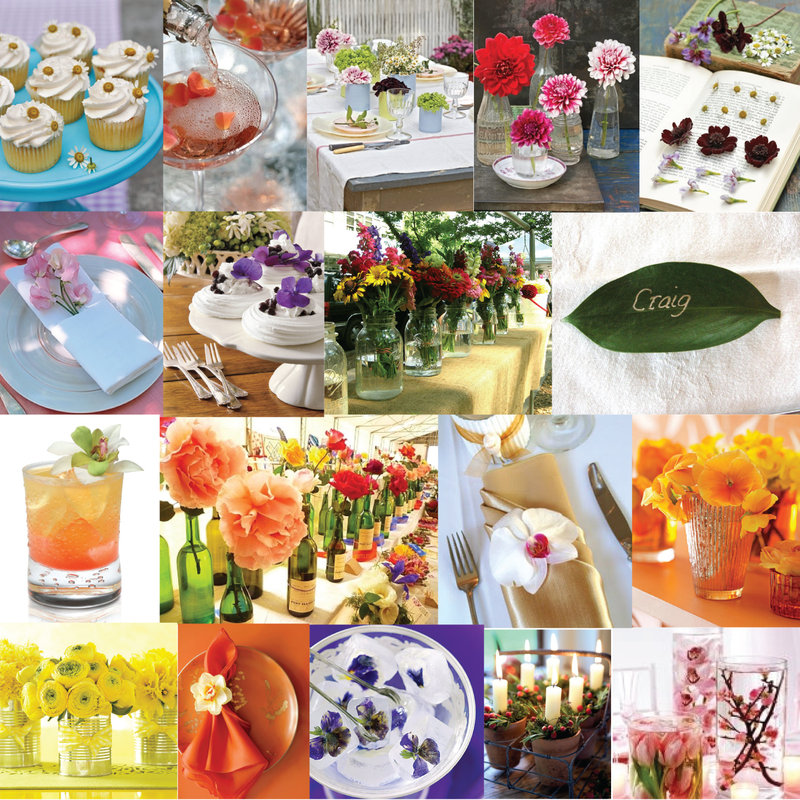 Below are 10 easy ideas using prepackage bunches of flowers that will transform your party or event. Add color and texture to any dessert by decorating your sweet treats with blooms of flowers. Use flowers such as chamomile, daisies, violets, or pom poms either directly on your dessert or on the serving tray. Take old garden pots and fill it with wet floral foam. Add a candle to the middle and fill around the edges with flowers. Try using different size pots to add interest to your table. When flowers begin to fade, don’t throw them away; press them in an old book for future projects. After they are dried frame the pressed flowers to enjoy them for years to come. For a simple grouping of flowers, turn used soup or coffee cans into vases for very little money. Spray paint the cans or cover them in fabric or paper to create cohesiveness among the containers. Place single blooms of flowers into individual milk jars, wine bottles, or mason jars. I recommend varying the heights of your containers to add interest. With a Sharpie write each guest’s name on greenery leafs and use them as place cards for your table. Add a little extra special to your party cocktails by floating rose petals in the bubbly. (Don’t worry roses are edible!) Roses come in numerous shades, which allow you to coordinate the petals with your cocktail. Add an extra pop of color to your table by tucking cut flowers into your guests folded napkins. To keep the blooms from wilting, wrap floral tape around the cut stem. To fold the napkin, lay it on a flat surface, and fold in half widthwise so the folded edge is near you. Fold the top layer back down halfway. Turn the napkin over, and fold the edges into the center. Finish by folding the napkin in half. Use candle votives (minus the candle) and place singular stems in each. Groupings work great on party tables or place one on a bathroom vanity or kitchen counter. Fill water to the top of your miscellaneous vases and submerged single stems or bunches of the same flower. A trick to keep the buoyant flowers in place is to use a floating candle; which also adds ambient lighting. Freeze edible flowers with water in ice-cube tray, then adding the colorful cubes to signature cocktails.